Pretty is nice, but tastier is better. The first birthday party cake sits in its glory; a thing of beauty created by a Master Baker. You feel guilty cutting into those layers of colored frosting and fondant, but once you have scraped off the sugar, food coloring, and decoration, you’re left with cake. If you want to have a memorable first birthday party, have a delicious tasting cake. I cannot tell you how many times a family member has bitten into a cake and instantly their taste buds remind them of other birthday party cake experiences. “Do you remember (insert name here) birthday party?” “Wasn’t that a terrible cake,” utters a family member. 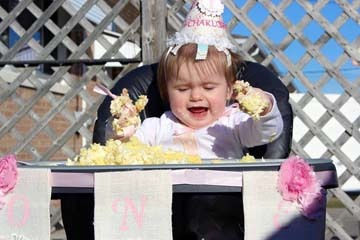 Cake, that sugar-coated, butter filled, flavored delight is the most memorable part of a first birthday party. Doesn’t matter what the birthday child wears, the food you serve, or how fancy the appetizers are, it’s all about the taste of the cake. Simply stated, White, Chocolate, and Marble are the most popular cakes. Veer from these choices and the approval rating drops. It is exciting to buy a fancy birthday cake with the decorative design, colors, and unique shape. But it’s the cake. And yes, sometimes it’s the filling, that makes a birthday party memorable. Over the years I have tried private bakeries, homemade, and store-bought cakes and found some of the best tasting cakes come from the local grocery store. Are they over the top, eye-catching, painstakingly decorated by a confectionery artist? No. But they taste great, and people ask for a second helping. Think of all the birthday parties you’ve attended in your life. The main memory about the party is … how the caked tasted. It wasn’t the pirate ship, Elmo, or covered in pink frosting cake you remember, it’s the taste. The key to having a great 1st birthday party is to make sure the birthday cake tastes great!